There was a moment of desperation for Real Madrid after Dele Alli scored just after the 26-minute mark. Cristiano Ronaldo, making his way down the left wing, used three step-overs and a feint cut back on Tottenham’s Kieran Trippier to put a shot just wide of the left post. This action was a telling one. Here were Real Madrid, down 1-0 (they’d go on to lose 3-1), and Ronaldo was trying to turn back the clock a couple of years, opting to go for old 1v1 tricks, and falling just short of a goal. This selfishness and reliance on individual brilliance to pull Madrid up from a rut didn’t stop there. No, in fact, moments later Marcelo would drift into midfield looking as if the positional structure wasn’t necessary anymore. Here were the mighty Champions League titleholders – down a goal, without a plan, and their players were improvising. Alli’s goal, alone, didn’t cause this, however. Los Blancos have been inconsistent all season and this improvisation was a last-ditch attempt to get past the roaring Wembley stadium crowd and try to level the score. What did happen, though, was a Mauricio Pochettino masterclass. With that said, what your run-of-the-mill match recap won’t tell you, is that there were positives worth mentioning regarding Madrid’s positional play in the final 20 minutes after Marco Asensio and Borja Mayoral came on late. We’ll get to that in a separate piece soon after this publishing. All isn’t lost in Madrid. The answer perhaps lies in their starting personnel and young talent. But Pochettino’s side was superior and they had a better game plan. So we’ll start with them. The strategy was similar to the one Pochettino used when both sides met last month which ended in a 1-1 draw at the Santiago Bernabeu. The Argentine opted to go to Madrid to play a more pragmatic game plan by Tottenham’s usual Premier League standards, and understandably so, of course, as Madrid were in better form last month (if only slightly) and Spurs were away in a tough ground to play in. Anyhow, in that first group stage meeting between the two sides, Pochettino played a 5-3-2 with Fernando Llorente up top with Harry Kane in a two-man striking partnership. 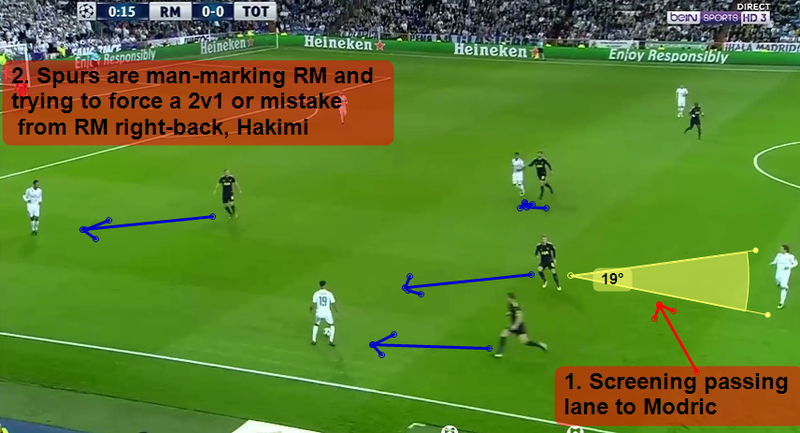 Spurs’ strategy was to press high man-to-man in their 5-3-2 shape and try and get 2v1 situations on Real’s full-backs and back line. Have a look below. 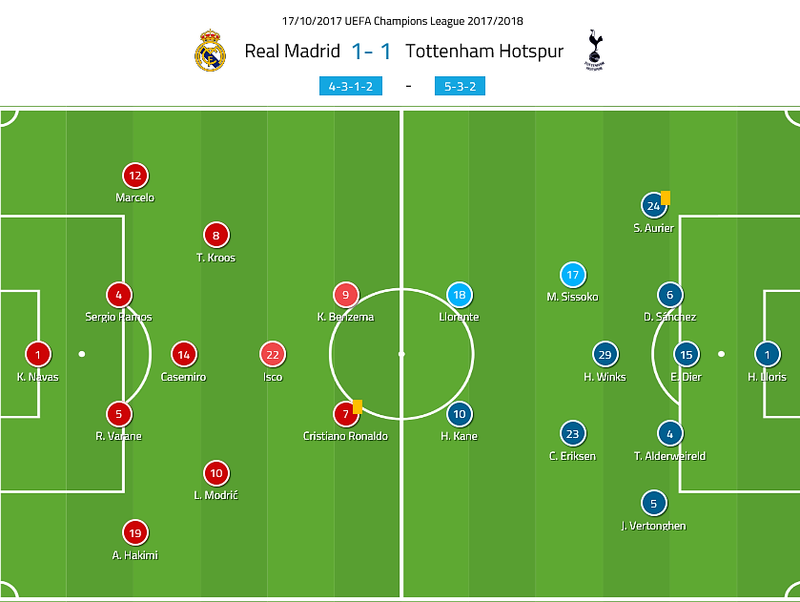 But after Spurs got on the scoreboard in the first half, the plan was to defend first, combat Real Madrid’s wide possession shape with structured overloads, and attack down the same wing or opposite wing to pull Sergio Ramos, Raphael Varane, and Casemiro into wide areas to isolate them using Tottenham’s pace, power and technique to get the job done in transition. How did Spurs set up defensively at the start? On Wednesday, however, the game plan was still to try and defend higher up the pitch and minimize risks after scoring first, but the areas of structure and where to target Real Madrid was different. They were to start the match in a zonal 5-3-2 high-block (not aggressive man-marking or pressing) and prevent Real Madrid from building up comfortably. They opted to push the back line a bit higher and try and set traps and overloads higher up the pitch as well. Below, we break down how their high-block worked. Have a watch. In the video above, you can see that Spurs set out to move there midfield-three and forward partnership of two to move as one block. Above, you can see the 5-3-2 and how the midfielders and forwards press up higher as one-block to force Madrid wide. After the switch to Ramos, Spurs midfield and forwards move to the ball-side in a compact block with Trippier leaving his line to press-up on Marcelo. Above, we see that Madrid right-back, Achraf Hakimi, has the ball and yet again Spurs’ midfield-three and striking partnership has moved as one-block to prevent a buildup through Luka Modric and Casemiro via crowding them. With Madrid’s right wing clogged due to Spurs’ block, Madrid switches the play to Ramos and Toni Kroos who are isolated on the other side, below. Due to both Madrid players being isolated on Spurs’ right side, this triggers Pochettino’s side to man-mark and press them with more intensity (above). Lastly, and below, we see that after Kroos switched the play back over to Nacho’s side (Madrid’s right side, Spurs’ left), Tottenham continue their 3-2 zonal block due to more Madrid players being on that side of the pitch. As a result, and with the ball finding Karim Benzema up top and down the right, the Frenchmen takes a poor touch and Spurs press and cut off all exits to win the ball. How did Real Madrid try and build up? 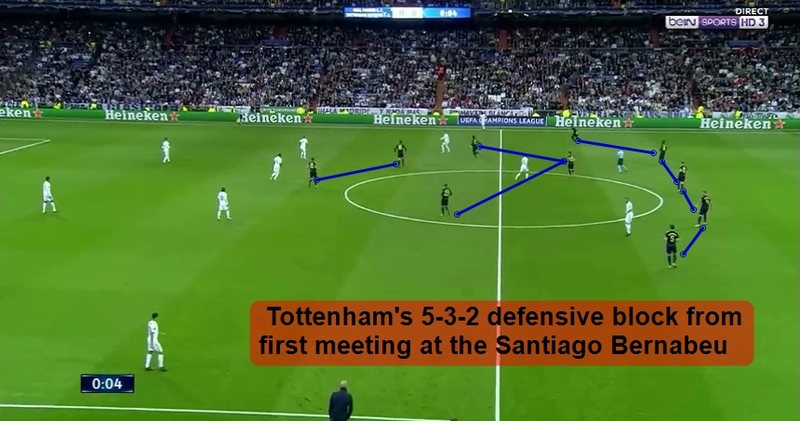 With Spurs’ structured and zonal high-block preventing Zinedine Zidane’s side from building up, Madrid had to find spaces via constant switches, and when they did and managed to push Tottenham into a more compact mid-block, they knew they had to exploit the spaces left open by Spurs’ narrow midfield three. Above, we can see how Benzema drops deep and out wide on the left to link with Marcelo to help draw Spurs’ narrow midfield-three to their side. Next, we see how Benzema find’s Modric, who is in the opposite half-space left open by Spurs’ narrow midfield, and that gives the Croatian time and space to find Madrid’s forwards, Isco, and full-backs’ vertical runs. Although Spurs are a good possession-based side, they opted to play and score goals from a more transitional strategy (transition from defence to attack). Instead of trying to force Madrid back via positional play and try and pull their low-block out of position, Pochettino opted to disrupt their build-up, defend in a mid-block and try and force Madrid’s midfield to make mistakes in dangerous areas so they could transition from defense to attack with more space ahead to test Ramos, Nacho, and Casemiro out in the open. Watch below for a video breakdown. To put it simply, Real Madrid were awful in almost all defensive phases on Wednesday – low-block, mid-block, and transitioning from attack to defence was awful, too. But, just prior to Alli making it 1-0 at the 27th minute, Real Madrid were extremely narrow down Spurs’ left side trying to combat an overload. Have a look, below. That is just too many defenders and midfielders in a narrow ball-side block for only a four-man Spurs’ overload. 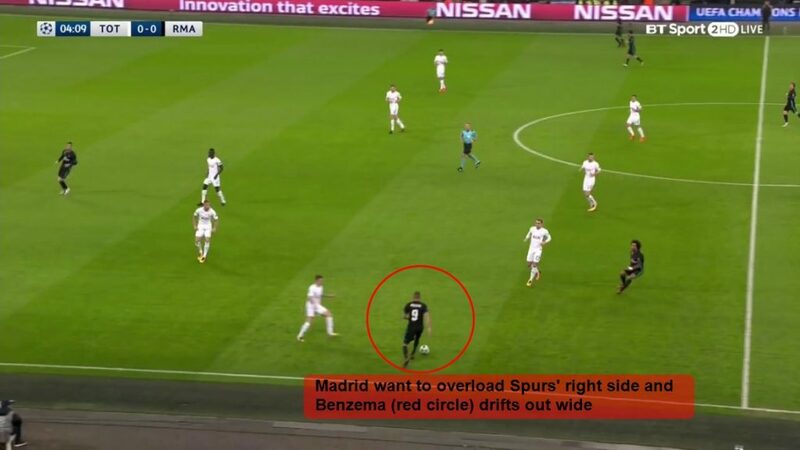 Madrid’s defensive coverage was awful. Soon after this screenshot, Trippier received the ball down the right on a switch of play and assisted Alli. Furthermore, Madrid set up in a 4-3-1-2 low-block at times with Benzema and Ronaldo not helping at all. It was pretty much ball-side, man-to-man and it wasn’t much better either. Zidane underestimated how Totteham would use the overloads as bait to switch for direct crosses and low-crosses, and thought he could deal with those Spurs’ overloads with aggressive man-to-man. But, we can’t forget that Ramos and Nacho were poor on their marking of Alli. They miss Varane, badly. Spurs’, for the most part, deployed a defend-first and counter-attack from deep strategy after going up 3-0. Above, you can see their 5-3-1-1 compact low-block with Alli (red circle) dropping from deep to trap Madrid midfielders from cutting inside. At times, though, the home side, when in possession, slowed the play down and wasted time (as they should be being up 3-0). Spurs’ low-block aside, Los Blancos got a goal back after Ronaldo capitalized on Madrid’s improved crossing from a loose ball in Spurs’ penalty box in the 80th minute. With that said, and as mentioned at the start of this piece, Madrid, after bringing on Asensio and Mayoral, improved their positional play. I’ll be writing a part two regarding Madrid’s issues and the positives despite a poor start to the season. All in all, Pochettino’s side is strong in all areas and has proven that against tough opposition they will resort to slightly unfamiliar tactics, but will be clinical, nonetheless.